Somewhere, Nancy Agee says, there’s a photograph of her as a 5-year-old on Christmas morning, holding her new puppy while wearing her first nurse’s cap. The photo captures the beginning of Agee’s interest in a medical career. As a teenager, Agee was a patient. She had five knee surgeries. Early on, she was told the problem was cancer and doctors would have to amputate her leg. Luckily, it wasn’t cancer and she kept her leg. The nurses and doctors who took care of Agee came to mean a lot to her. “I wanted to be like them,” she says. Agee became a nurse, then an administrator and later a health-care executive. 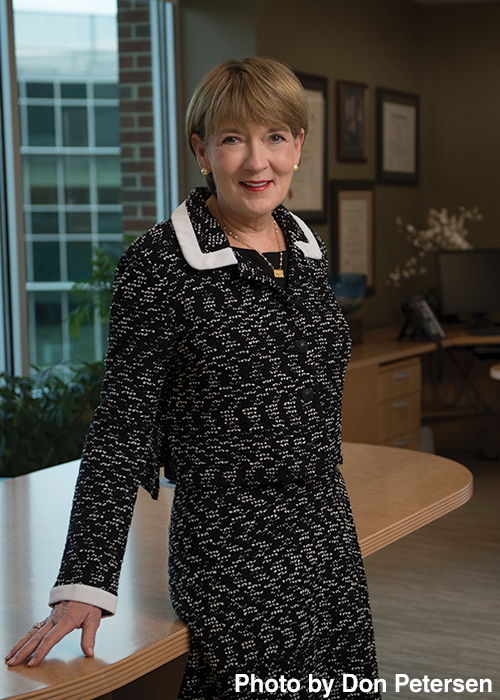 She was named Carilion’s chief operating officer a little more than a decade ago when it began transforming itself from a hospital network into a physician-led clinic. Agee became president and CEO in 2011. Based in Roanoke, Carilion serves Southwest Virginia’s roughly 1 million people at more than 200 patient-care sites, including seven hospitals. The largest private employer in western Virginia, Carilion has 13,000 employees, including almost 700 doctors, Last year, the health system generated $1.7 billion in revenue. In addition to providing health care, Carilion has become an economic driver under Agee, collaborating with Virginia Tech on the creation of a medical school and research institute. The facilities are the anchors of an evolving “innovation district” that is attracting highly skilled professionals to Roanoke. Next year, Agee will become chairwoman of the American Hospital Association board of trustees at a time when national policy on the direction of health care remains in doubt. 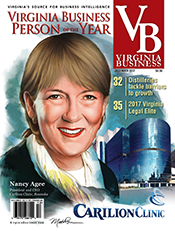 In recognition of her influence in so many areas, Virginia Business has named Agee its Virginia Business Person of the Year for 2017. That’s a very short version of the story, one that leaves out a lot of experience, a lot of work. 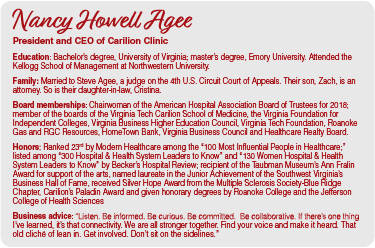 Agee was born in 1952 in Crippled Children’s Hospital, a name Roanoke’s hospital bore for a few years during the height of Southwest Virginia’s polio epidemic. Her brother was born in the same building two years later, but by then it was called Roanoke Memorial Hospital. Carilion rarely has been more dynamic than it was 11 years ago when it began to move toward the clinic model. “The economic ecosystem was changing,” Agee says. “It is still changing. This was previous to Obamacare, but Obamacare didn’t just happen overnight, right? Leading Carilion through the transition was Agee’s predecessor, Dr. Edward G. Murphy, who died in October at age 61. Murphy, who spent a decade as Carilion’s leader, was instrumental, along with then-Virginia Tech President Charles Steger, in the creation of the Virginia Tech Carilion School of Medicine and Research Center beginning in 2007. While development of the medical school was universally praised, not everyone was on board with the clinic model at the beginning. Some physicians rebelled, refusing to work with Carilion under its new organization. Agee’s frontline experience likely helped build that support. She’s sure it helps her management. Caring for patients, after all, is the principal reason for Carilion’s existence. Agee learned early on that rules can get in the way of patient care. She remembers a patient who hadn’t eaten all day and wanted something at 10 p.m. The kitchen was closed. There was no way to get food at the hospital, and Agee wasn’t allowed to leave the building. She left anyway, going to a grocery store to get the patient some pudding. Despite the fact she was helping a patient, Agee got a “dressing down” from her supervisor. Agee remembers a cancer patient who was in and out of the hospital so often he was a favorite with the staff. Agee came to work on a Christmas morning with presents and flowers for the patients her nursing team was serving. She had yellow roses for everyone except that cancer patient. He was getting a red one. She was so excited to tell the other nurses about the gifts and her plans to slip them into rooms before patients woke up, she didn’t notice the empty room across the hall. The popular patient had died during the night. Teamwork is at the center of the medical school Carilion and Virginia Tech created with the help and support of local and state government. Aspiring doctors at Virginia Tech Carilion School of Medicine train with students from Carilion’s Jefferson College of Health Sciences, which offers degree programs in various fields including nursing and health-care administration. The medical school graduated its first class in 2014. More than 5,000 applicants competed for 42 slots in the class that entered the school this fall. The Virginia Tech Carilion Research Institute, meanwhile, has attracted $80 million in federal funding. In October, the institute broke ground on a new $67 million, 105,000-square-foot building, which will allow the institute to nearly double its number of research teams to 51. Those teams are working on research that’s advancing medical knowledge and creating bioscience spinoff companies. Restaurants, stores, a coffee shop, an outdoor performance venue and a kayak launch on the Roanoke River have sprung up near those apartments. A few blocks away, Carilion has turned a former grocery store into an institute for orthopedics and neurosciences. “We took an abandoned building and made an amazing, thriving, gorgeous place,” Agee says. New businesses are springing up near there, too. Carilion Roanoke Memorial Hospital anchors one end of the newly designated Roanoke Innovation Corridor. It stretches to downtown Roanoke, the Virginia Tech Carilion health sciences and technology campus, past the Jefferson College of Health Sciences to the former Gill Memorial Hospital, now a business accelerator. Carilion and Virginia Tech also work to build the regional economy through tools such as the VTC Innovation Fund. Created in February, the fund has $15 million to invest in what it calls “life sciences and disruptive technology opportunities” that are within 150 miles of Roanoke or that have a strong connection to Virginia Tech or Carilion Clinic. Agee says she and Virginia Tech President Tim Sands share a vision. “We understand that the economic ecosystem is important to both of us,” Agee says. Things aren’t so upbeat in all of Carilion’s coverage area. Its hospital in Tazewell County is losing money. It’s a small facility. With only 56 beds, it’s not even the largest hospital in Tazewell County. Tazewell’s unemployment rate in September was 5.5 percent. Neighboring Buchanan and Dickenson counties were at 6.9 and 6.5 percent, respectively. Virginia’s unemployment was 3.7 percent that month. That part of Virginia’s economy is changing as coal — which has lost tens of thousands of jobs to automation, energy market forces and environmental regulation — fades. Medicaid expansion helped rural hospitals in some depressed areas across the country, but Virginia didn’t expand Medicaid under Obamacare. So, that’s a lifeline Southwest Virginia doesn’t have. In the meantime, Carilion is changing its focus in Tazewell to more primary care. It’s also contracted with the U.S. Department of Veterans Affairs to serve veterans in the area. Rural hospitals are likely to change a great deal, Agee says. “I think our utility and dependence of hospitals, especially small hospitals, will decline,” she says. “I don’t think that’s a bad thing. I think we can provide really good care in new ways. The whole idea of technology is exploding … I think that’s going to change the way we do things. I think settings like urgent care, where you don’t need a whole hospital, are going to be the wave of the future. 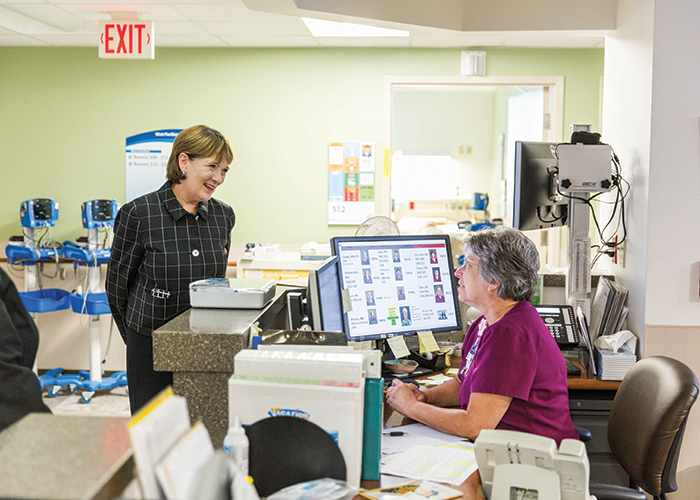 Jeanne Armentrout, Carilion’s executive vice president and chief administrative officer, has been with Carilion for 35 years. Armentrout says Agee “surrounded herself with mentors” as she rose, then “she really gave that gift on to others,” including Armentrout. William Jacobsen, administrator at Carilion Franklin Memorial Hospital, had been out of health care for years, doing mission work in Asia, when he interviewed with Agee and her predecessor, Ed Murphy. Jacobsen decided to join Carilion because he felt the organization was doing the right things. Its focus was about the patients.